We write to every valued customer who has bought from us or used our services to thank them and ask them politely if they would recommend us to their family and friends. We also ask them to complete a questionairre so we can identify areas for improvement. These are some of the comments that our customers have left. March 2012 We will be adding the details of some of the installation and projects we undertake to give you an idea of the scope and quality of works undertaken. We hope this gives you confidence in using us !! 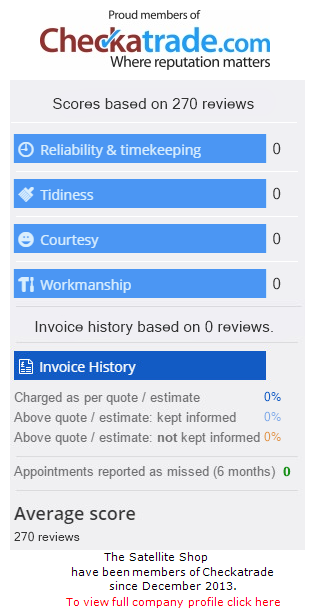 We now use Checkatrade to generate our testimonials. Click here to view our profile page. I would recommend this company. Very approachable and easy to get on with and they get on with the job in hand. We found Karl most helpful and knowledgeable in his advice for setting up Sky+ in our flat. Also the engineer was experienced, quick and very competent. I felt Mr Jones your engineer was very efficient in his work, explained everything in detail and tuned the set up to receive all German channels. I will recommend your service to anyone. Thanks. Very good. I had to change the timing of the appointment which was handled perfectly. Thank you so much for this device. Thank you for your prompt and personal service. The young mand who called was very helpful, polite and efficient. Would recommend him. It was very good, great service and friendly staff. Good service and expertise. Good to use previous technician. 10 out of 10 and the aerial is working very well, we are very pleased and the installer was a very nice chap. Your staff - ’Karl’, was extremely knowledgeable and very helpful. Very good as we had specific requests regarding delivery dates/times and you met our requests without issue. Thanks.